Trestle Theatre. OUR COMPANY. — Trestle Theatre Co.
Trestle is a mask and physical theatre company: our mission is to inspire creativity through participation and dialogue and we do this by approaching opportunities with an open mind, playful approach and our ever surprising and engaging masks. Trestle has been making innovative physical theatre since 1981 and in recent years has focused its work on school workshops, performances and teacher training; we work in partnership with schools, FE colleges, PRUs and Universities to deliver the skills and resources needed to encourage high quality learning through the arts. Create and deliver high quality mask and physical theatre performances and training locally, nationally and internationally. Support creative growth and improved mental health and well-being through our participatory work with young people and adults. Deliver professional development for teachers and arts practitioners, including MA, PGCE and CPD training. Trestle is also an Artsmark Partner delivering all of our workshops and participatory projects in line with the quality principles. Emily Gray became Artistic Director of Trestle in 2004 and has led the Company through major transformations, including the establishment of Trestle Arts Base, creating a physical theatre language beyond mask, introducing half mask resources and directing highly successful TIE programmes with performances and resources, including in recent years Strange Case of Dr Jekyll & Mr Hyde with University of Bedfordshire, the Yarico Education Programme as part of the Royal Opera House Trailblazer’s programme and The Deadlies, with York Theatre Royal. She has developed Trestle’s teaching and training provision to include delivering an MA in Drama Education and PGCE training with Middlesex University, as well as expanding Trestle’s mask and physical work in Primary & Secondary schools, PRUs and with home educated students. Trestle’s work has evolved to embrace health and wellbeing agendas and involves regular sessions with young people with mental ill-health issues and vulnerable adults at risk of isolation. Before coming to Trestle, Emily was Artistic Director of TAG Theatre Company in Glasgow, Associate Director at Unicorn Theatre London and Associate Director at Nottingham Playhouse & Roundabout TIE. Clare joined Trestle in November 2009 as Finance and Fundraising Manager and is now Trestle’s Finance and Operations Director, overseeing the development of Trestle Arts Base as a community resource and professional performance venue. Clare studied business at Harlow College and originally worked in the private sector; she soon became disillusioned with the working ethos and spent the next 15 years working in a children’s charity, delivering education through the arts for young people of all ages and abilities. She has worked in front of house and accounts with a variety of companies and is a fundraiser for the Western Sahara. Clare has a passion and talent for photography and has won numerous awards. Helen Barnett joined trestle in March 2017. She trained originally in drama at Loughborough University and went on to gain an MA in Directing from East 15 Acting School with a module training abroad at GITIS in Moscow. Helen then went on to work as a freelance theatre facilitator and Director working with companies such as The Bush Theatre, The Tricycle Theatre, Polka Theatre and Watford Palace Theatre on various education and outreach projects alongside her role as Artistic Associate with Sphinx Theatre Company. She was also resident associate artist at the Royal & Derngate Theatre in Northampton in 2014 and guest lecturer on the third year of the Acting Course at Northampton University for the last three years before joining Trestle. Rhian became Marketing and Development Manager for Trestle in December 2009. Originally studying under Trestle founding member Sally Cook at Melton Mowbray Performing Arts College before graduating with a BA (Hons) in Devised Theatre from Dartington College of Arts (2004). For a number of years Rhian worked as a freelance theatre facilitator for various UK arts organisations and then as a producer for Lamfrag, a short film collective whose work was shown internationally at prestigious festivals. Before joining the team at Trestle she worked at both The Alban Arena and Harpenden Public Halls as the Marketing and Press Officer. Joseph started working in the café for Trestle in September of 2009, after finishing his degree in Fine Art at the University of Hertfordshire. He instantly fell in love with the masks and quickly progressed into the mask making department on a part time role. Within the next year he had become full time and taken the position of Mask Team Leader. He is now determined to progress further with Trestle masks and hopes to help bring an exciting future for the company. Karene joined Trestle shortly after finishing her degree in English Literature and Drama and started work as a duty manager in the cafe in May 2014. She quickly fell in love with the company and began working in the mask department as a mask maker. Soon after she became Company Coordinator and hopes to grow with Trestle in the future. Joe joined Trestle as a mask maker in September 2012 after finishing his Music and Sound degree at the Portsmouth University. As well as mask making he runs retro film nights as the producer of Retroplex film club. Elaine is our Gallery Programmer and Finance Assistant as has been with Trestle since 2009. She studied Applied Art at the University of Hertfordshire and also works as Arts Development Officer at Three Rivers District Council. Mary joined Trestle in 2009 and has extensive experience in the Hospitality and Catering Industry, her particular area of expertise in Culinary arts and is a professionally qualified Chef. Jeanne has extensive experience in marketing and communications and her career has ranged from coordinating large outdoor events to being chief executive of Arts and Media (skills development for artists to grow their practice and business) and a Manager with Arts and Business. ‘I have supported Trestle as a Patron for over twenty years and have been delighted by the inventive use of mask, puppetry and storytelling through the Trestle’s Masked years and into the Unmasked productions. The last show, The Birthday of the Infanta was a celebration of performance, storytelling and physical theatre; evidence of the Company’s continuing and considerable prowess as a creative force in UK theatre. 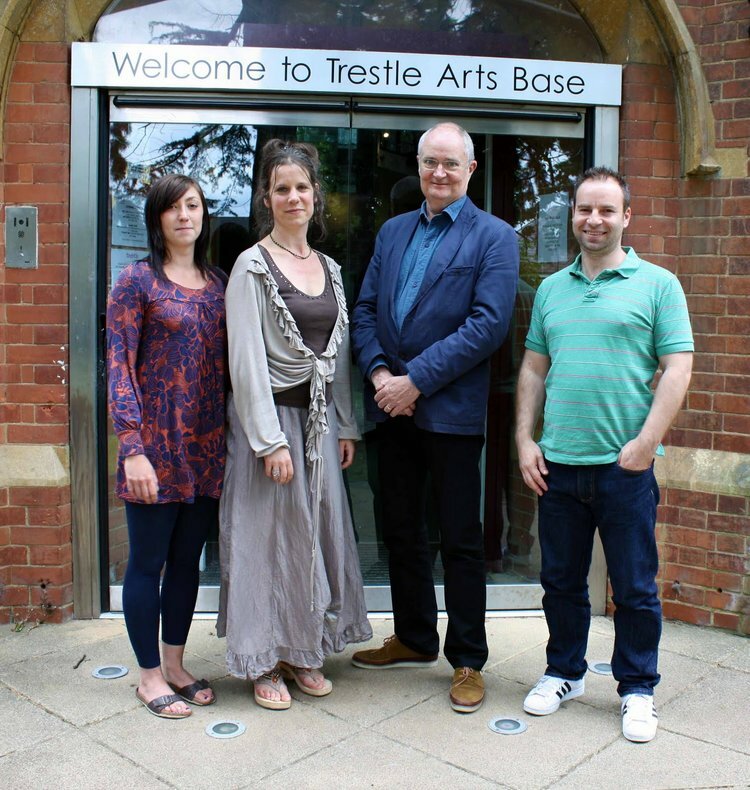 Trestle led the way as the first UK touring company to build its own home and the beautiful Trestle Arts Base in St Albans has inspired artists from across the globe to make new work. The Company has moved with the times and adapted to circumstance while sustaining a strong commitment to artistic quality, community development and young people. However, Trestle’s unique creativity and ways of linking touring work with participation programmes and a community building are threatened by cuts in government funding. For thirty years Trestle has given the arts community, young people and audiences across the UK inspiration and learning and now is the moment for you to give back to Trestle.